Latest update of SSC CGL Tier 3 2018: Read the latest information of SSC CGL 2018 tier 3 in detail with topics list for each topic. Answer: SSC includes the letter writing in the descriptive paper because all the department you join find a major issue that employees don’t know about how to write a professional letter. So now they add this writing part in the third paper. Every SSC CGL aspirants think ” Essay writing is so easy” but the professional essay writing have rules that you must follow before starting the first paragraph. A lot of students visualize an essay in a paragraph but the reality is different from the actual thinking. Essay includes points like- Build your vocabulary and use it properly, remember Words to help develop an argument, Tell the reader what other people say, use prefixes, suffixes, Strong Vocabulary Read More about Essay Writing. Question: What is Precis Writing? Answer: They provide you a meaningful passage and you should write a short paragraph in own words(With a set of rules that is defined here for SSC CGL). Write must have a logical order and be well-knit and well-connected sentences Read More About Precis Writing. 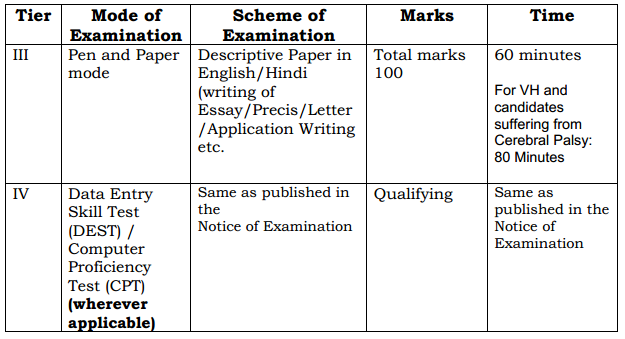 These are the important points that you should follow when to write the application in the SSC CGL exam Descriptive Paper. Keep Your Focus Narrow and Personal so you take max points from the examiner. Opening paragraph: an introduction of yourself like- Name, Position in Company, Other professionals details. Our Team prepare the full matter for SSC CGL descriptive paper like- examples, full material so keep in touch with us or press CTRL+D to BookMark This Page. The Tier-III of SSC CGL 2016 which would be a descriptive paper of 100 marks in Pen Paper Mode will be tentatively held on h March, 2017. Sir, please tell me, How to improve writing skill & maintain accuracy. It is a major problem of most aspirants. With due respect, I would like to draw your attention about the congestion which is created by street vendors. The street vendors has displayed their shops on the road which is meant for moving vehicles. These shops are creating problems for the big vehicles for moving on the road. Due to these, there are always congestion on the roads. We, the common people have problems while walking and buying the groceries and other things. These vendors are also poor people. The should be provided areas for their shops so that they can earn and congestion problem can also be solved. I, therefore, request you to find the solution of congestion and to satisfy the vendor. I shall be highly obliged to you. Adequate and prompt action will be much appreciated. Note: This is the correct format of official letters. Hope, it would help you all. This format is not correct, according to new CBSE rule, salutation (dear sir) will come before the subject. Sir, I’m a hindi medium student. Can you provide me some material for ssc cgl tier 3 descriptive paper. Sir can you please provide with some important topics of essays to be done for cgl tier 3…. The video on precis writing is ultimate. Not for a single second I got distracted while listening to it. Very interesting !! Specially when he reads out the kind’s story (was a little funny but that is what made him interesting ). Hats off Sir !! very good content. If I write words in an essay more than limit , will my marks be cut ? I am an english medium student …..may i prefer for hindi in descriptive paper? Sir, please tell which language first prefer in tier3 Hindi or English. sir please tell us the topics for Subjective Paper. Sir, plz suggest books for tier 3 of SSC CGL 2016. Sir will it prefer between english and hindi medium. Marks of discriptive exam comparly more then hindi medium students . you are doing well please i want your notification on my mail id as well.